It sounds like they’re saying that he’ll be swallowed alive and come back safely. If that offends you, it’s for good reason. There are several problems with this idea. 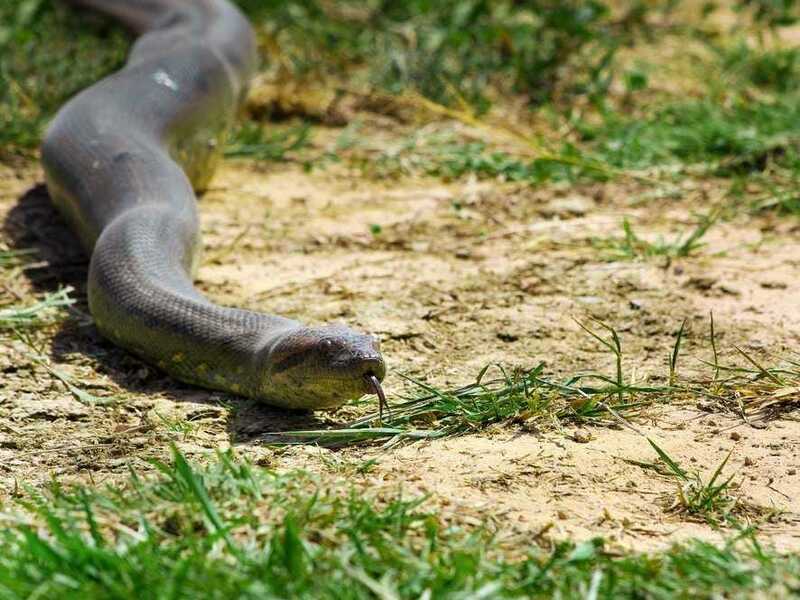 We’ve talked to a couple herpetologists and added some points made by snake expert Lisa Powers in a post for Red Orbit into eight points that lay out exactly why this stunt is terrible. Even though the anaconda is the biggest snake on the planet, it still rarely gets longer than 22 feet — finding one big enough to swallow a human would be incredibly difficult. Normal the biggest prey an anaconda can eat is about 30% of its mass. For the biggest anacondas ever seen, about 29 feet long and 550 pounds, that might put a human adult into possible range, but such large anacondas are extremely rare. 2. Human shoulders are wide. Even though the largest anaconda may be able to swallow the sheer poundage of an adult male human, snakes still don’t usually eat anything wider than the largest part of their body. Since humans have broad shoulders, especially if they’re reinforced with a protective suit, this is going to be extremely problematic. While snakes can eat something that’s still alive and might give that a try if their food item were small, they would likely try to constrict and suffocate an animal as big as a man before swallowing. During constriction the snake asphyxiates its prey by tightening its coils every time the meal breathes. To deal with this, the suit would either have to stand up to the constant pressure so Rosolie wouldn’t be crushed, or the snake handlers would have to forcibly stop the snake from killing Rosolie — either way making it unlikely that the creature would try to eat him. 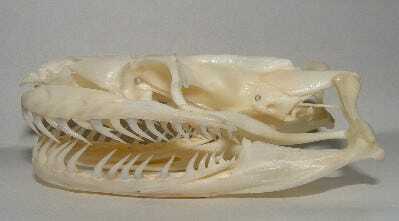 Mokele/Wikimedia commonsThese teeth belong to a Burmese python, but an anaconda’s teeth are similar. Anaconda teeth are recurved, or backward facing. Though they aren’t venomous, they are still sharp and strong and hold and pull in whatever the snake is trying to swallow — making it very difficult to exit the snake through the mouth. Whatever suit Rosolie wore would have to protect him from these as well — and pulling him out against these curved, hooked teeth would be particularly difficult. In a promo for the show, you can hear Rosolie say “you’ve got to go head first.” Powers agrees, but she says that being swallowed would probably make Rosolie move, which would cause the snake to try and constrict him again. There’s just no way the snake would continue trying to eat him after such difficulty, no matter how tasty Rosolie looks in his snake-proof exoskeleton. In the promos, you see that Rosolie’s suit has a cord attached to it, presumably so that he can be pulled from the nether regions of the snake’s digestive system. But if he was actually swallowed and then forcibly pulled out, it’s hard to imagine that not damaging the creature. 7. Internal injuries to the snake. When a snake swallows very large prey, which Rosolie would certainly be, “their esophagus is stretched to the point of being paper-thin,” according to Dr. Stephen Secor, a biologist at the University of Alabama. Trying to remove that large prey would very easily tear the throat of the animal. 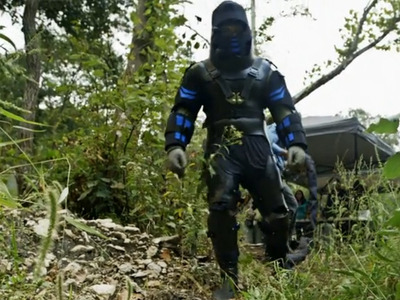 Discovery had originally asked Secor to consult with the show, but he refused because the stunt was dangerous, unscientific, sensationalistic, and based on fear — even if they had good intentions of promoting “conservation,” which is what Rosolie has said. It’s pretty clear this stunt is impossible to do without hurting the snake. And while there are sometimes reasons to injure or kill wild animals, there is no educational value at all from this — it sounds like it’s being done purely for the ratings. For these reasons and many more, the show has stirred up a good amount of negative attention, including a petition to stop its airing. The petition calls it “animal abuse to the highest degree and absolutely disgusting” and at this time it has more than 22,000 signatures. But when you really think about it, the stunt doesn’t even seem possible in the first place — herpetologist Frank Indiviglio agrees that the whole idea was “nonsense.” It’s very possible this is just another example of the “fake documentary” programming that has become popular among science networks. These “mocumentaries” have misled people into thinking fictional creatures are out there, including monster sharks and yetis. 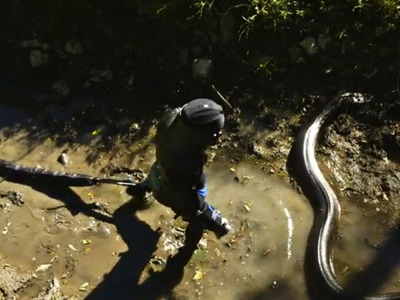 When Business Insider contacted Discovery to ask if they actually showed Rosolie being physically swallowed by the anaconda, they told us that they were not putting any more information out at this time, so we don’t know if perhaps “enter[ing] the belly of an anaconda in a custom-built snake-proof suit” somehow means something different.